A character grabs your imagination – in this case Sergeant George Arthur John Prigg RAFVR. An airman about whom little appears to be known or remembered. Sgt Prigg was the navigator in P/O Roy Gallop’s 625 Squadron crew who were lost on 30th January 1944, Berlin operation. 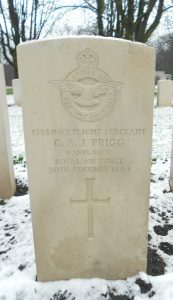 The CWGC entry records no family information for Sgt Prigg. 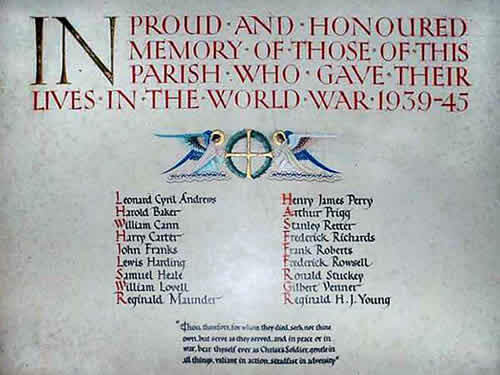 Arthur Prigg’s name appears on the Ottery St Mary 1939-1945 War Memorial Plaque. The accompanying information on the Devon Heritage website records – ‘133043 Flight Sergeant/Navigator George Arthur John Prigg of the RAF, 625 Squadron. Son of Tom and Eliza Prigg; husband of Ledia Prigg of Canada. Born in Pinhoe in 1906. Died 30 January 1944 aged 38.’ – right at the top of the ‘elderly’ range for RAF operational aircrew. Pilot Roy Gallop was undoubtedly at the other end of the age range – three weeks short of his 19th birthday when he died. 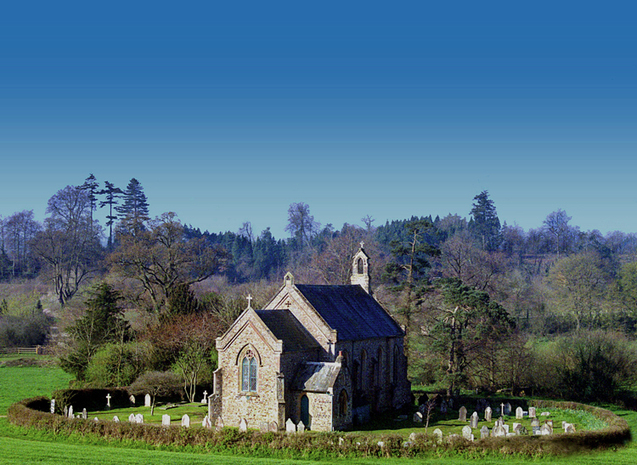 Genealogy records suggest however, that George A J Prigg was born in the second quarter of 1921, registered in Honiton. George A J also appears to have been married to Phyllis M Collins, the marriage also registered in Honiton. George A J Prigg’s mother’s maiden name was apparently Hawker – more digging reveals that (Mabel) Florence Hawker married George Bernard Prigg in 1907, again, the marriage had been recorded by Honiton’s Registrar. The couple had two daughters – Kathleen Phoebe Prigg b 1909 who sadly died in infancy the same year and Mabel C M Prigg b 1910. Tragically Mabel died in 1925. Young George’s father had served in the First World War – 141551 2nd Corporal George Bernard Woodley Prigg of the Royal Engineers, son of George and Phoebe Prigg (Woodley). George B was born in Ottery St. Mary in the December quarter of 1883, and had been awarded the Military Medal, gazetted 21st October 1918. George’s brother Harry had been killed on the Somme on 20th April 1917 serving with 2nd Batt Devonshire Regiment. The 1939 Register places George B Prigg – a master plumber, and Florence M at 24 Paternoster Row, Ottery St Mary, Devon, a property shared with carpenter Louis and Ida Carvell, plus two others whose records have been officially closed (although one was apparently a Prigg – most likely young G A J). St Mary’s Church is at the western end of Paternoster Row, just round the corner from The College where Ottery’s famous son Samuel Taylor Coleridge is reputed to have been born. F/Sgt Prigg’s service number 1338043 was allocated by Weston-Super-Mare Recruitment Centre between November 1940 and September 1941. As a member of the RAFVR his service would have been deferred until he was required for training. ‘The Musical Times’ publication for February 1941 carries in its section for ‘Church and Organ Music’ a piece on the distribution of diplomas for January 1941 by the Royal College of Organists. Among 14 others, G A J Prigg passed his Associateship Examinations and received his diploma. The occasion was recorded in the Exeter and Plymouth Gazette of 31st January 1941. Given Arthur’s musical talents it is possible he had previouly been a pupil at the King’s School, Ottery St Mary, yet to be confirmed. Arthur was still in Ottery in mid-July 1941 when he was organist at the funeral of neighbour and close friend Trooper Harold Baker of 15th/19th The King’s Royal Hussars, Royal Armoured Corps. ‘The wedding took place in Escot Parish Church, on Saturday, of Miss Phyllis Mildred Collins, only child of Mr and Mrs H Collins, of Escot and Sergt Navigator George Arthur John Prigg RAFVR, only son of Mr and Mrs G B Prigg, Ottery St Mary. The Rev. L G Appleton officiated, assisted by the Rev B C Jackson. The bride, who was given away by her father, wore a gown of ivory embossed satin, with long sleeves, pointed over the hands, with gathered bodice and train. She wore her mother’s pearls. Her headdress was of Honiton lace, over 100 years old, and the veil of silk embroidered tulle. She carried a bouquet of red carnations, lillies of the valley and white heather. She was presented with silver horseshoes by the bride’s god-daughter, and the bridegroom’s aunt and cousin. The bridesmaids were the Misses Jean Baker and Patricia A Jarrett. They wore powder blue crepe de chine dresses and head-dresses of wreaths of anemones, and carried posies anemones in silver holders. LAC J Ward RAFVR was best man. The bridegroom was organist and choirmaster at Ottery St Mary Parish Church before joining the Forces, and the choirboys from the church attended the service. 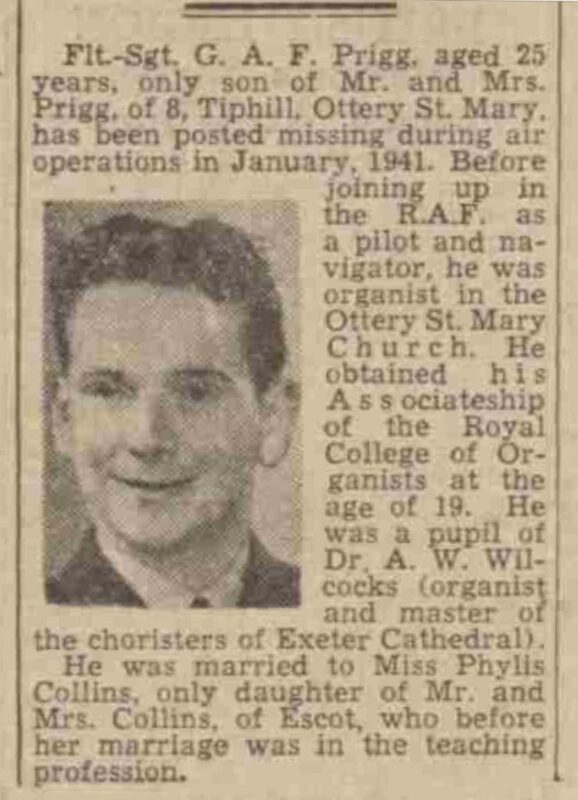 Mr H Dyer was organist. The hymns were ”Praise My Soul, the King of Heaven” and ”O Perfect Love”, and the choir rendered Samuel Wesley’s anthems ”Lead Me Lord” and ”Love One Another”. The church was decorated with flowers picked by the children of Feniton School, where the bride is assistant teacher. The bridegroom’s gift to the bride was a natural opossum fur coat, and to the bridesmaids he gave silver bangles and Savings Certificates. The bride gave the bridegroom a pair of ebony-backed nynon hair brushes in leather case. After returning from his honeymoon Arthur would have continued his RAF training, by now he had probably reached (O)AFU or AOS stage. Roy Gallop was at 9 pre-AFU Course between 26th February and 26th March 1943. The Gallop crew’s Australian wireless operator Sgt Pat Moylan’s service record indicates that his posting to 81OTU – RAF Tilstock or its satellite station RAF Sleap, commenced towards the end of June 1943. Gallop’s five man crew – assumed to have been Gallop, Prigg, Rawlings, Moylan and a gunner – either Wightman or Jones progressed to 1667CU RAF Lindholme on 21st September. Sgt Roy Gallop and crew were posted in to 625 Squadron from 1667CU on 28th November 1943. Sgt Prigg did not appear on the Battle Order until 20th December, the crew’s first outing was with W/O Ted Ellis at the controls, flying with his own navigator Sgt Arthur Boud on the eventful sortie of 2nd December. 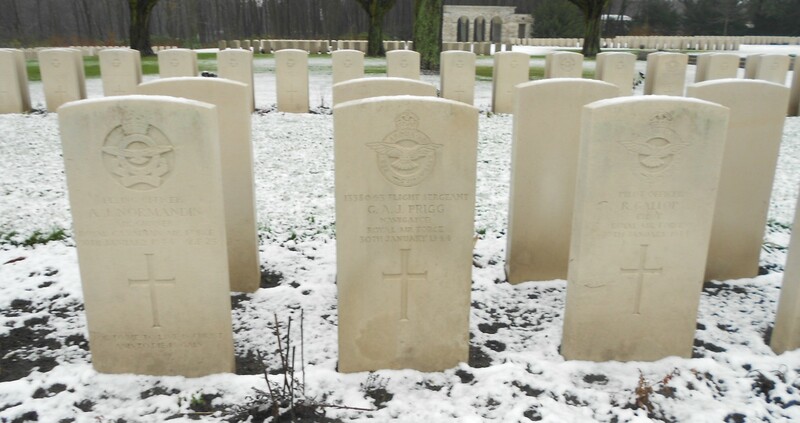 Nor did Prigg fly on the abandoned sortie on 16th December when S/L Douetil’s regular navigator Sgt Price filled in. 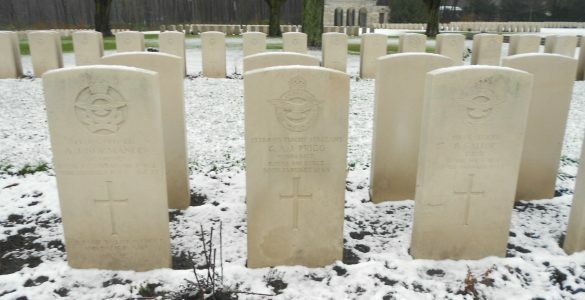 Sgt Arthur Prigg flew on operations on 20th December – Frankfurt, and through January, on 1St, 21st 28th and 30th, each to Berlin, with an early return detailed in W/O Johnson’s log-book for 27th which was not recorded in the ORB Record of events, but the squadron’s summary confirms that a defective air speed indicator had cut the sortie to Berlin short. up 16.52, BERLIN – Failed to return. No news after take-off. Lancaster JB122 was shot down by a German night-fighter about 30miles North-west of Berlin outbound to the ‘Big City’ and exploded in the air, scattering debris over a wide area about half a mile west of Linum (52.75N/12.82E) village centre. The crew members were buried in Linum Cemetery in unmarked graves. The graves were investigated in 1947 and positively identified as the crew of JB122, as, on one of the bodies ‘a garment was found bearing the number 1338043’ – Sgt Prigg’s service number. F/O Normandin’s remains were identified by his officer’s battle-dress and both were re-interred in Linum Cemetery in May 1947, in grave 16 and 15 respectively. The remaining members of the crew were re-buried in a collective grave but with individual headstones, 17-21. In sad contrast to the newspaper report of Arthur Prigg’s wedding, the MREU Investigation Report records somewhat pointedly that (presumably on information gleaned from local witnesses) at the original burial ‘no Christian rites were performed, neither were any military personnel present to give the Military honours as is the custom in civilised countries. The crosses on the graves gave no indication of the identities of the bodies or the correct date of death’. A couple of errors found their way into the Western Times’ of March 8th 1946… which can be forgiven as it was over two years after Arthur Prigg had been posted ‘missing’. George Arthur John Prigg was 22 years old when he died on the evening of Sunday January 30th 1944. His bride Phyllis went on to become headmistress of High Bray school, Brayford, nr Barnstaple. Phyllis re-married in 1948. Arthur Prigg – a popular and talented young man.